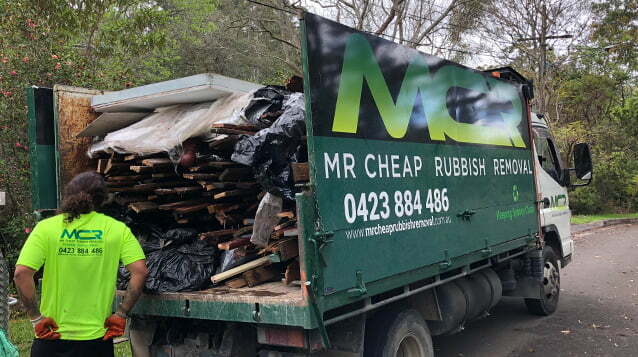 Mr Cheap Rubbish Removal offers the cheapest rubbish removal services around Sydney. In fact, we’re even cheaper than skip and bin hire in the majority of cases and when you choose us, you don’t have to do any of the heavy lifting, disposal or clean-up. We take care of it all for you! The price we charge is carefully calculated for each job based on a combination of the cubic metre volume of rubbish that you want us to take, and the type of rubbish you have (green waste / industrial waste, etc). If you don’t know exactly how much rubbish there is, then you can send us a photo of it by text or email (a few different angles preferred), and we’ll give you an obligation-free estimate. We won’t be beaten on price. If there’s another company that offers you cheap rubbish removal, we’ll beat their price. With our rock bottom prices, it’s unlikely it’ll ever come to that though! Call us today to see just how cheap your rubbish removal can be! Type of your rubbish such as green-waste, household furniture, food or organic waste, brick and concrete, mixed demolition waste and etc. Volume and weight, We charge most of rubbish by cubic meter. It starts from $80-$150 depending on the type of rubbish. Mr Cheap Rubbish Removals started as a family business and remains that way. We are proud of our history and our professional services. Before we come to the site, please help us out as much as possible by making the rubbish as easy to access as possible – the closer we can get to the rubbish, the quicker and easier we can load it up, and the cheaper the price will be in the end! We can assist with all types of junk removal prices and offer a completely obligation-free quote onsite. There are no hidden charges – just a fixed price that is custom created for your job – so you can rest easy knowing the job is completely taken care of! Call for same day service on 0423 884 486 or if it isn’t urgent fill out our form and we’ll get in touch. General rubbish consists of clutter, junk, rubbish overflow and what your local council won’t pick-up. Industrial waste is your renovation materials, builders waste and rubble. We are cheaper than hiring a skip bin. Commercial waste management means we recycle your old and outdated office electronics. Ask us about e-waste. Our commitment to outstanding service is second to none – we ensure your site is clean before we leave. We have no issue with hard to access levels. No job is too big or too small for us. We’ve come a long way from our humble beginnings with just one truck, but we still remain an old school family business. We are proud of our history and aim to continue to build upon and grow our fine reputation.